Several abortive projects were started, including the 1973 design for a nuclear-powered aircraft carrier of 85 000 tons which would be capable of accommodating 60 to 70 aircraft. In the early 1980s, two less ambitious projects began to make serious progress, the Project 1143.5 which was to become the Kuznetsov and the 75 000-ton Project 1143.7 which, had it been built, would have been the Ulyanovsk. This nuclear-powered ship with twin catapults was proposed to carry the upgraded Su-27KM and Yak-44 AEW/ASW fixed-wing aircraft within its complement of 60-70 aircraft. The flight deck area is 14 700 m² (158 235 sq ft) and aircraft take-off is assisted by a bow ski-jump angled at 12 degrees in lieu of steam catapults. The flight deck is equipped with arrester wires. Two starboard lifts carry the aircraft from the hangar to the flight deck. The ship was designed to operate Su-27K, MiG-29K, Yak-41 (and later the heavier and more capable Yak-43) supersonic STOVL fighters, but the only fixed wing aircraft regularly taken to sea have been the Su-27K (Su-33) and Su-25UTH, the latter being used as an unarmed trainer. The first unit was originally named Riga. The name was changed to Leonid Brezhnev and then to Tbilisi before settling in October 1990 on Admiral Flota Sovetskogo Soyuza Kuznetsov, normally being shortened to Admiral Kuznetsov. Construction of a sister ship (Project 1143.6, initially named Riga and later Varyag, the second of the class, started in December 1985 at Nikolayev, and the ship was launched in November 1988. Late in 1991 the Russian Defense Ministry stopped financing the carrier, and handed the hulk over to Ukraine. In 1998, the sale of the Varyag was announced to a Macau-based entertainment company. The unfinished hull was to be towed to the Far East where it would be converted into an entertainment complex and casino. Though this company appeared to be a front for the Chinese Navy. In China Varyag was restored and refitted. This aircraft carrier entered service with the Chinese navy in 2012 as the Liaoning. It was one of the most ambitious Chinese naval programmes. Currently Lianoning represents a significant shift in the balance of naval power in the area. 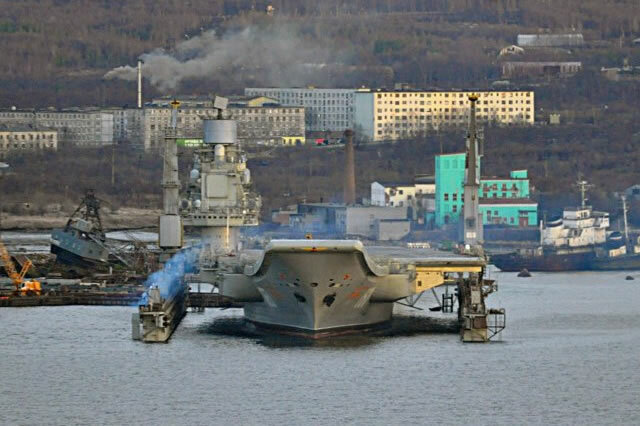 Russia's only aircraft carrier, Admiral Kuznetsov , is nearing the end of a work-up period outside the port of Murmansk before heading for the eastern Mediterranean, reportedly to begin air operations against targets in Syria. The first combat deployment of Kuznetsov was announced by Russian defence minister Sergei Shoigu on 21 September, when he said the 55,000-ton carrier would be escorted by six warships and three or four support vessels. A Russian MiG-29 fighter jet has crashed into the Mediterranean Sea as it tried to land on the Admiral Kuznetsov aircraft carrier, the country's defence ministry has said. The pilot ejected safely from the plane, the ministry said. The defence ministry said the crash was as a result of "technical malfunction" during a training flight. The jet came down a few kilometres from the carrier and the pilot was picked up by a rescue team. Russia's sole aircraft carrier, the Admiral Kuznetsov, began its first combat deployment to Syria with plenty of fanfare, but a recent report from IHS Jane's indicates Russia has given up entirely on launching strikes from the carrier. Satellite imagery obtained by Jane's shows Su-33 jets and one MiG-29KR previously aboard the carrier now stationed at the Hmeymim air base in Syria alongside land-based planes from Russia's air force. The Kuznetsov, never an entirely reliable system, had one of its MiG-29KRs crash in November, and another pilot had to eject after the Kuznetsov's landing gear failed and couldn't receive the aircraft, Jane's reports. The Su-33 is the second aircraft that has been lost from the Kuznetsov fleet during its ongoing mission in the Mediterranean. Earlier, a Mig-29 fighter jet was not able to land and ran out of fuel because the deck crew of the carrier failed to fix a broken arrestor gear. The repair and upgrade of the Project 11435 aircraft carrier Admiral Kuznetsov will start in September at a shipyard near Murmansk in north Russia, a source in Russia’s defense industry told TASS. 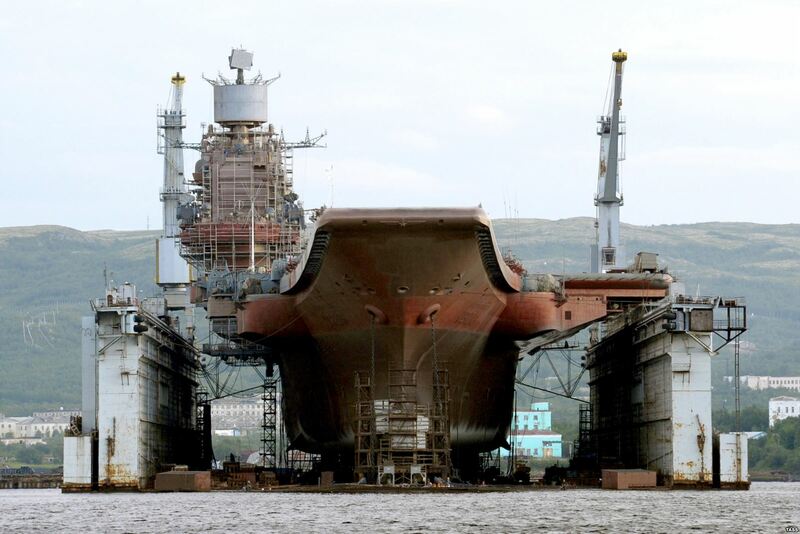 Almost 40 billion rubles ($714 million) will be spent on the ship’s modernization, the source added. According to the source, the ship’s electro-mechanical equipment, including the main propulsion unit, will be repaired. Its several faulty boilers will be replaced. The flight deck and associated equipment will be modernized as well, the source added. The repairs of the Admiral Kuznetsov aircraft carrier of project 11435 will begin in 2018 and the costs have not been determined yet, Russian Navy Deputy Commander for armaments Vice Admiral Viktor Bursuk said at the naval show in St. Petersburg. The project will cost between RUB55 billion and RUB62 billion (USD887 million and USD1 billion) and will involve more than 1,000 engineers and technicians. The sum is described by Russian defence industry sources as “more than modest”, but also not sufficient enough to carry out a serious modernisation of the ship. The most basic area of the ship’s design to be addressed is its power plant. The current engines were built in Ukraine and replacements could only be sourced from there or the United States – both politically untenable – so the ship’s eight boilers will instead be replaced with more modern and reliable ones. Secondly, the carrier will receive a new suite of onboard electronic systems. Kuznetsov is currently fitted with the Mars-Passat (NATO codename ‘Sky Watch’) radar system: a first-generation, phased-array system based on Soviet-era passive array developments. However, the Mars-Passat system has never functioned to specifications – not even in Soviet times – and is completely outdated today. The ship will thus receive a current-generation Almaz-Antei Poliment-Redut radar system, which operates with the relatively new S-350 Vityaz naval surface-to-air missile variant. Russia's only aircraft carrier was damaged and a giant floating dock sank after a crane crashed onto the vessel as it was undergoing repairs near the Arctic city of Murmansk on Tuesday. Four people were injured and one person is missing after the accident involving the Admiral Kuznetsov at the PD-50 floating dock, the largest in Russia one of the largest in the world, local authorities and media said. Local media said the floating dock holding the vessel had sunk. MOSCOW, Nov. 19 (Xinhua) -- Russia's sole aircraft carrier Admiral Kuznetsov, damaged in a floating dock accident last month, will be upgraded in time, Russian Industry and Trade Minister Denis Manturov said Monday. The modernization of Admiral Kuznetsov began in October 2017 at a plant in Russia's northwestern port city of Murmansk. The work is scheduled to be completed in 2020 and the vessel is expected to return to service in 2021. But the PD-50 floating dock, one of the largest in the world, sank on the night of Oct. 30 during the planned release of the Admiral Kuznetsov from it. A falling crane damaged the ship's take-off deck. Four people were injured in the accident, one of whom died later. Another worker is still missing. Manturov said that options include building a dry dock structure at a nearby shipbuilding plant, acquiring a new finished dock, or using a dry dock at the Sevastopol plant in Crimea. The 300-meter-long and 67-meter-wide PD-50 dock, built in Sweden in 1980, is to be recovered, Manturov said, without specifying the exact date.